This shot captures the mood of the past week and its weather – washed out, muted and yet serene. This long exposure is lacking any cloud movement or fascinating elements to make it stand out incredibly, but that’s why I like it. 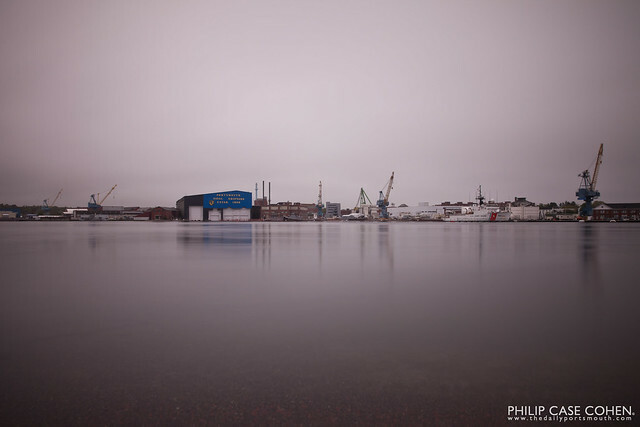 The simple softness of the flowing water and the lack of color aside from the sign painted on the shipyard building, making readers aware of its birth in 1800. The bucket of the crane is empty. It’s been unloading sand from the freighter Hera for days now….replenishing the nearly depleted supply on the Market Street terminal. I loved being out at night and watching how the lights on the massive cranes illuminate the scene…yet only enough to shed some light where it was needed to unload. I actually saw each of the four bays on the freighter being unloaded at various points throughout the week…with the sand/salt mountain looking pretty ominous all over again. It is sounding like we might be graced with more white fluffy stuff from the skies over the weekend. 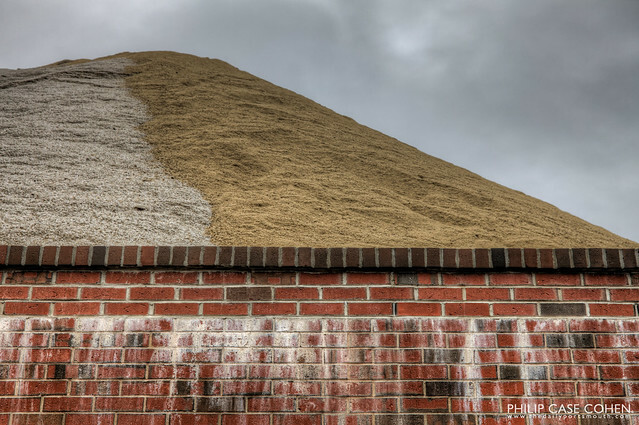 In honor of that, here’s another take on the salt piles along Market Street….which will play a huge role in keeping our streets drivable. Thanks to Granite State Minerals for keeping New England salted and sanded! I’m hoping to get out for a round of snow shooting if it arrives. More warmer weather & sunny images to follow over the next few days so stay tuned! 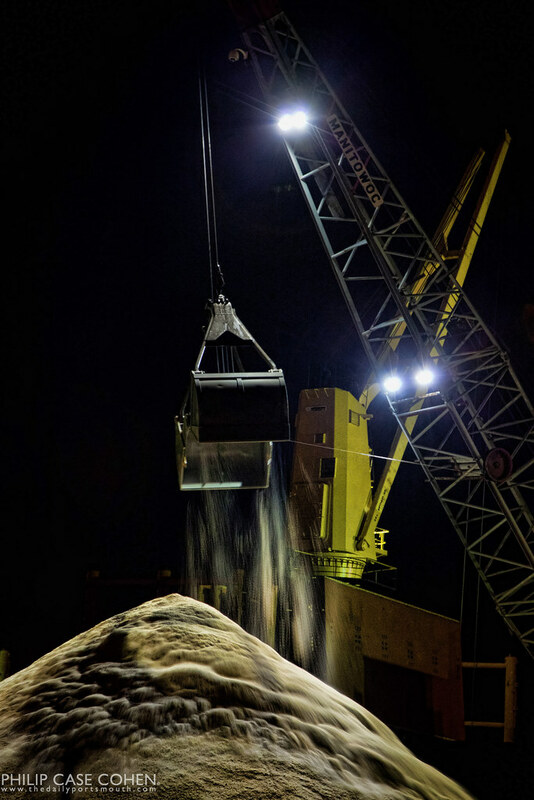 The Sand & Salt Piles that line Portsmouth’s working waterfront are owned and operated by Granite State Minerals. As I’ve written time and time again, I love this time of year…not so much for the colder temperatures (which make for cold fingers out shooting, especially at night), but for the increased river traffic. This past week, the Atlantic Majesty returned to unload some massive amounts of sand. 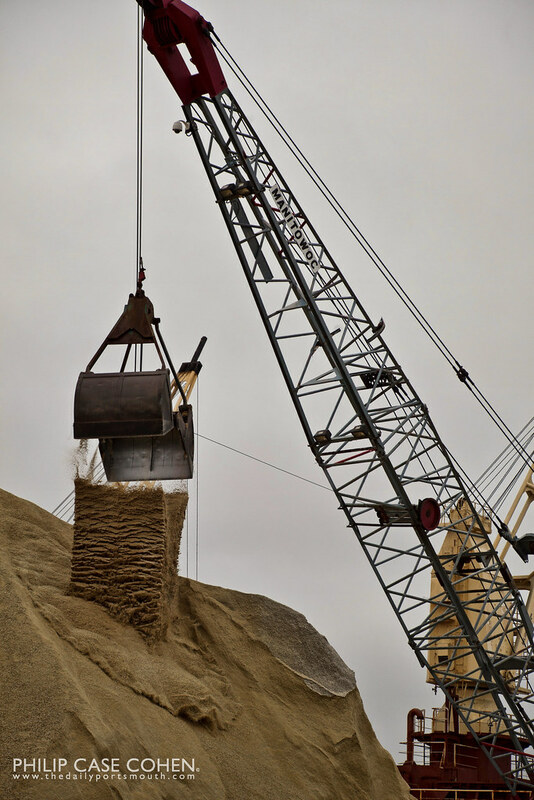 Today’s shots feature the fascinating dump of sand from the crane…I never get sick of seeing the sand fall out so quickly, watching gravity take hold of the materials. 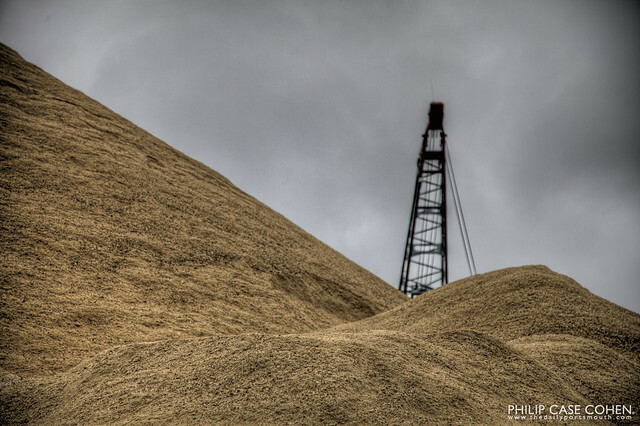 Below, the sand pile grows over the wall on Market Street. In other news – be sure to check out the new header at the top of the site! 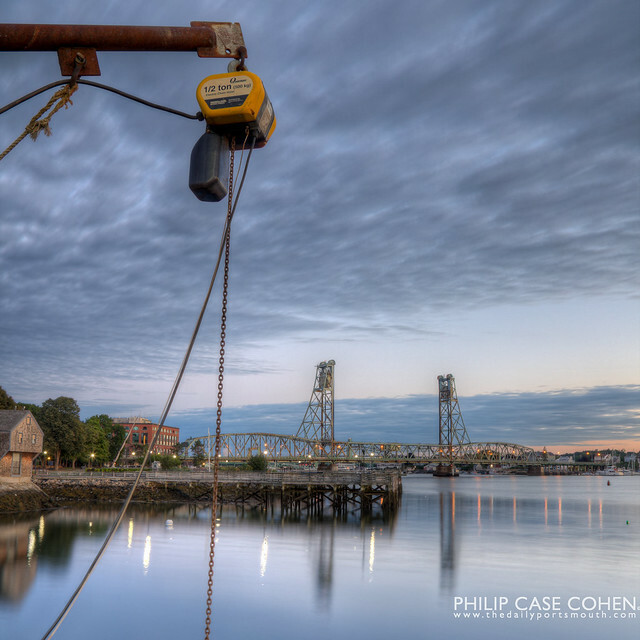 I decided I needed an image with a little more clarity to welcome visitors the Portsmouth’s waterfront. Here the Bow Street waterfront can be seen from the sidewalk of the Memorial Bridge. I’m not entirely sure what this crane contraption is used for – but I imagine it’s used for unloading the local catch…which I think is very cool. We’re fortunate to have a robust local fishing economy – though I’ve been reading it’s getting harder and harder for them to remain in business. I love having guests in town and taking them out to one of our many great restaurants…where there’s plenty of fresh seafood to be had. I’m curious what the actual breakdown of local fish vs. non-local…but in any event, it’s delicious and I think the Commercial Fish Pier is one of the coolest spots in town. It was also pretty awesome to have the tall ships docked there earlier this year! 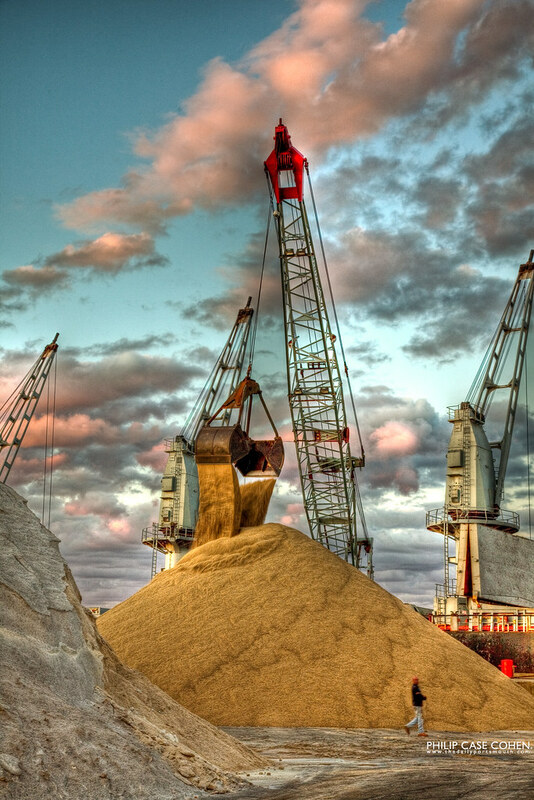 Sand being unloaded from a visiting freighter at the Granite State Minerals terminal along Portsmouth’s waterfront.